Our hydraulic casing tongs are primarily used for making up or breaking out casings or pipes. The casing tongs are fully hydraulic driven. They are configured with a large-torque motor and perform mechanical gear change. Featuring simple structure and safe operation, our casing tongs can be supplied with torque device to complete computer monitoring and managing on pressure, torque and rounds. Our casing tongs, which are produced according to API Spec 7K, have been awarded the National Invention Patent. Rugao Yaou Company is a manufacturer and supplier of hydraulic casing tongs. In addition to oil drilling tools, we also produce drill bits, wellhead control equipment and well cement tools to suit your various needs. Thanks to their reliable quality and competitive prices, our oil drilling equipment is very popular in America, Brazil, Australia, Egypt, Germany, and other countries. Furthermore, we can provide onsite maintenance, debugging, training service, as well as OEM service, upon request. 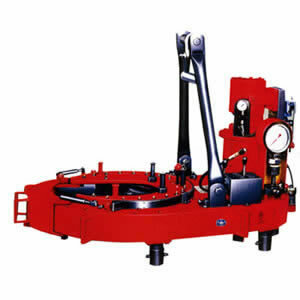 The hydraulic drill pipe tong marked with II is the power tong supplied with DS suspension device. The hanging height of the power tong can be adjusted by operating the manual control valve in the suspension device. A spinning wrench is a good substitute for rotary rope or chain. It is an oil drilling tool used to offer mechanical advantage in applying torque to turn objects. Our spinning wrench is designed and manufactured in accordance with API Spec 7K "Specification for Drilling Equipment".